Most strong photographic projects require a true connection between the author and the subject/topic they are looking at, which, somehow, suggests connections to their autobiography. This may show obviously, be more subtly suggested, or not appear at all. 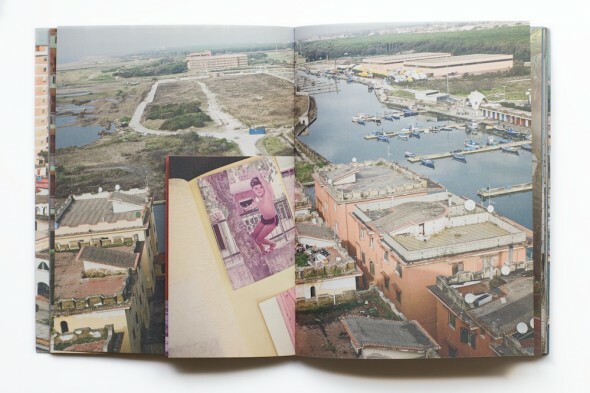 Salvatore Santoro is very obvious about it in his book “Saluti di Pinetamare”, when including reproductions of photo albums or photo frames of him as a child, and of his family at that same time, on holidays in the area he returns to as a photographer today. One could fear the approach to be a gimmick and to fail, had it been just: “look how happy/innocent life was then, and how terrible this place looks now”, illustrated by empty pools, and dilapidated constructions. When in fact Santoro’s work is both deep and complex. The short text opening the book -which refers to a “Kalashnikov shooting” heard by the author- alerts the reader that there is something more at stake here. Santoro does bring to light the failure of a touristic real estate project of the 60’s –of which there are so many in Europe-, with buildings falling to pieces, or this abandoned hotel covered by wine. But the images are not located individually in the Italian geography, so already one starts generalizing what is shown as a comment about the country’s global situation. Italy’s economic situation in 2012 includes ruins, includes a mall and a private party of some wealthy people, but obviously it also includes illegal immigration, and drug trafficking. All of which is represented in this work, which only focuses on a small strip of land/road north of Naples. There is a nostalgic quality, for sure in “Saluti di Pinetamare”, but it is much deeper than a simple nostalgia for a lost childhood. The author has grown into a man, fully aware of the context and challenges facing his country, which he addresses with a bit of sadness, as “the direction taken by mankind is far from reaching a better future” as he writes in the book’s conclusion. Yet what I appreciate is that Santoro stays in touch with life, with the life being lived today. If he certainly misses the good times of his childhood, he enjoys and participates in the –fewer- good times lived by people who still go to that place to spend their holidays. So the sad reality depicted in the images, is balanced -to some degree- by the optimism suggested by people we see enjoying life on the beach. The book’s final image of some youths on their Vespas at a red light fits into this optimistic perspective. That image includes the photographer’s car’s dashboard, which tells us that he, too, is still part of this place’s story and life. The production of the book is quite nice, with an economy of graphic design -which is good graphic design to me-. The printing respects the subdued colors visible on an overcast day near the beach. The inclusion of smaller booklets of the author’s pictures as a child bring an interesting dynamic while holding the object in hands. But as the main subject is not to make an autobiography, there is no excessive use of those inclusions, which thus remain welcomed breathers in the general storytelling. This first self-published book reminds me of the often talked about “Gomorah Girl”, by Valerio Spada, both because of the production choices (matt paper, desaturated colors, different page formats), and because they both address fundamental issues facing Italy today in more conceptual ways -and formally challenging- that the works of their predecessors, such as Ferdinando Scianna, who defined an era of Italian photo reportage. Santoro and Spada take the same subject (the Mafia and its social consequences) but address it is a very modern and contemporary manner. I am impatient to see their next projects!